The K5 is aimed towards C300 Sized Cameras. Our slider is designed to protect rail base shaft parts for solidity. The rail base also has tough materials to protect it from shocks, rain and dust. The shaft inserted in the rail is made of high carbon chrome bearing steel and enhanced surface hardness to HrC60 by a higher frequency treatment. We have put heat treatment concentrically on the abrasive parts and precisely grinded it to make its surface roughness low. This process is critical technology (it is called “Super-Finishing”). When we put both treatments together the appearance looks like a mirror. Not only a splendid look but it also decreases surface roughness. In addition, double row angular contact bearings in K3 and K5 slider makes a complete rolling motion. This whole process makes sliders much better quality. Double row angular contact bearings which are over P5 grade allow running precision. (0.02mm in 6m without accumulation). If you mount your slider onto a tripod and flip it vertically using a ball head or a fluid head you can emulate crane motion. Reveal something from the ground up or top to bottom. In addition, you can set up the slider like a vertical line through 1/4-inch or 3/8-inch screw holes at both sides of the sliders. You can set up the tripod or head at the bottom of the slider rail. 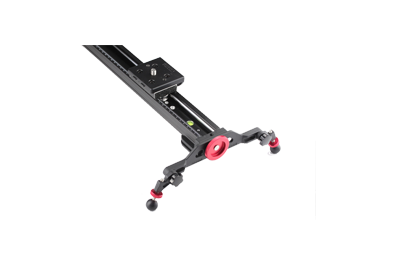 Combine the slider with a modular ball head or 3/8-inch to 5/8-inch adapter (not included) and allow you to get push/pull, side slides and even vertical shots. You don’t always have to slide right to left. Push your camera into the subject, pull away from the subject and pass object on the way. There are two ways to adjust friction in our slider. First is to loosen and tighten the red knob. The tension can be adjusted instantly. Second option is to use a hex wrench (provided).